For us Bernedoodle lovers, one of the best qualities of our beautiful dogs is their glorious thick and curly coats! Like they say beauty comes with a price… and as you probably already know along with that wonderful curly coat comes lots of curly hair in their ears which can cause discomfort and infections and absolutely must be plucked on a regular basis! The weight of the hair in combination with the size of the ear flap itself, may prevent proper air flow inside the ear canal that can cause a number of health problems, which can be avoided by checking your dogs ears often and regular consistent grooming starting when they’re puppies. The most important step is plucking ear hair. Plucking the hair out of the ears is something that MUST be done regularly, and is usually done by your groomer (included in most groomers bath and groom services, but do ask!). This is somewhat painful for the dog if not done right, and goes easier and faster with ear powder. Ear powder permits gripping power for easier hair removal. Plucking hair out of the ears can be somewhat uncomfortable for your dog, but they will grow accustomed to it. I liken it to plucking eyebrows. Here is a link to where we purchase our ear powder. Watch the video below for instructions on how to do this. The cleaning of ears should be routinely done when your pup is bathed, but won’t hurt to check in between baths either. Simply take a cotton pad or ball, drizzle a bit of witch hazel, your clear facial cleaner or if you have none – a bit of rubbing alcohol onto the cotton pad. Wipe out the inside of the ear, dip into the ear canal and clean out the folds. Depending on if it is simply dirt from playing outside or natural occurring ear grease or more – that is it for basic ear cleaning. Not too hard, right?! Really filthy ears need to be washed with water and shampoo while being bathed. 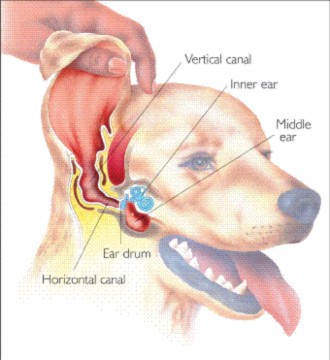 There is that myth that water in the ear causes ear infections or deafness – not so unless we are already dealing with a dog that is heavily susceptible to ear infections in the first place. When you shampoo the pup or dog, simply put a dab of shampoo onto your finger tip and use it to clean the inside of the ear, not forcing the finger deeper than it will naturally go – which is not far for a pup, and depending on the size of the adult poodle to about the first digit. When you rinse, do the same with clean fingers and then use the towel during drying to wick up extra moisture. A good head shake will usually take care of the rest. Here is a homeopathic recipe for the solution we use here at Cedar Creek to care for our dogs' ears. Its economical and easy to make. disperse the Boric Acid Powder.